There are first times for everything. And this is our very first gig – through a family member (you gotta start somewhere) at the University of Amsterdam. For months my jazz trio and I went through the Vocal Real Book alphabetically, so my knowledge of jazz standards is extensive by now. As we sing and swing away, I particularly feel proud to sing all the songs in the original key. Then, in the break, actor Marnix Kappers enters the scene. I did recognize him in the crowd, he’s on TV a lot. Turns out he’s a friend of the family. He has something to tell me. I’m completely sobered up, and, I must admit, effectively downsized in any self-glorification. Doesn’t he know that it takes years to train your voice? Then again… he might have a point. As I cycle home, I still hear his words ringing in my ears. This unprecedented incident always pops up when I hear Annie Ross sing. The world works in mysterious ways. Annabelle Allan Short (born in 1930), or Annie Ross, is a British-American singer and actress, best known as a member of the jazz vocal trio Lambert, Hendricks & Ross. Born into a family of touring Scottish vaudevillians, she has been performing ever since her early childhood. Her lyrics to an instrumental jazz solo – a practice that became known as vocalese – resulted in the landmark composition ‘Twisted’ and in her winning DownBeat magazine’s New Star award in 1952. She recorded several solo albums before she got on board with the Lambert, Hendricks & Ross trio. 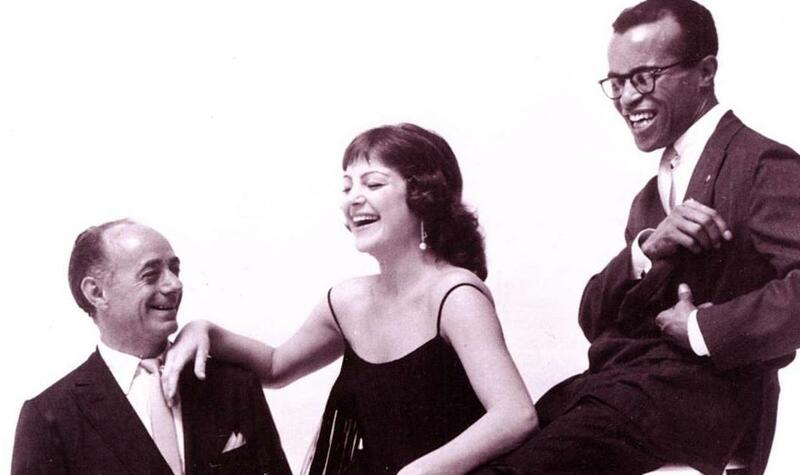 Their first album Sing a Song of Basie (1957) was an instant success and the trio became an international hit, with several albums and tours all over the world. Ross left the group in 1962 – it is said to break her habit of heroin – and in 1964, she opened her own nightclub in London. Annie Ross is still performing today – she appears weekly at the Metropolitan Room in New York City. Her interpretation of songs is simply mesmerizing. Let’s go y’all! First: find an original score of your song. Get a version with the melody written in it, find it in the Vocal Real Book or songbooks by composers. What is the original key of the song? Second: look for the highest and the lowest note in the composition. Third: know which highest and which lowest notes you can still sing comfortably. Many songs in the American Songbook are too high for most female singers, where male singers can sing them in the original key. A third, a fourth or a fifth down for female singers usually works. Fourth: transpose – use the app iRealPro to get an instant feel if that key suits you. Record yourself and listen. Does it sound and feel comfortable? You’ll be okay! At least for now. Hopefully Marnix Kappers would agree with you too.